Requests for bids to build the school were made in July of 1886. The completed school was small at only 32×36 feet, with just one classroom. It was Gothic in design with a graceful looking bell tower. It had two entrances, one for the boys and the other for the girls each entrance having a 6×6 vestibule. The sash bars of the windows are all horizontal, after the style of the school buildings in Europe. The building cost about $2,500 and took about two months to build. The first home according to the above article was built for Erwin Howell. The two-story colonial was built at 4065 Oakmore Road. Just a few of the homes in the Oakmore Highlands Neighborhood. All photos taken by Cheney Photo Advertising Company and are from Oakland History Room or OMCA. The Leimert Bridge was designed in 1926, by George A. Posey, to safely accommodate vehicle traffic, Park Boulevard Streetcars, and pedestrians. 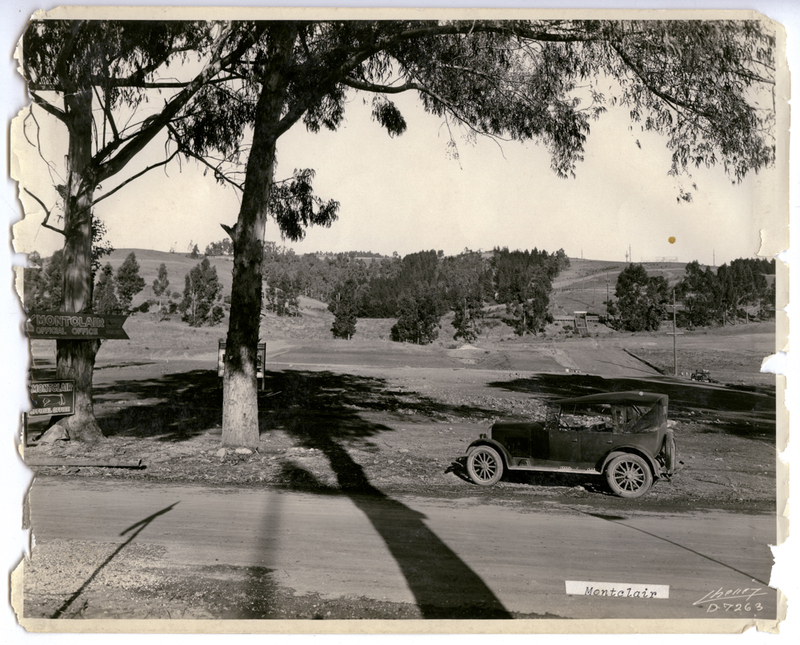 The original subdivision was bordered by Sausal Creek and Dimond Canyon. During the initial sales period, good design was promoted through a model open house program called the ‘Oakmore Home Ideal’ where buyers could visit a custom home designed by local architects Miller & Warnecke. Later, in 1934, The Leimert Company teamed with the Oakland Tribune and Breuner’s Furniture Company to furnish a demonstration model home that drew 8,000 visitors in a three week period. The following year another Breuner’s furnished house was nicknamed “Golden Windows” to highlight the expansive use of glass on the view side of the home and the commanding views from the subdivision. Broadway Terrace @ Ostrander St. (see below) Photo from: Oakland History Room. College Pines is located at the corner of Broadway Terrace and Harbord Drive location(formally Edith), just past the Claremont Country Club. The name of College Pines was chosen because of the close proximately to College of the Sisters of Holy Names, new High School. The sales office was located at the corner of Broadway Terrace and Ostrander Road, as seen above. Below are pictures of Broadway Terrace and Chetwoood and Broadway Terrace and Harbord Drive. They were taken in 1933 and are from the Oakland Public Library History Room. The homesites front on along Harbord Drive for about a half mile or more. The lots were priced at $27.00 per foot. A forty foot lot would cost $1075.00, with a low down payment and easy terms. Sold by the Claremont Pines Corporation and later Michell & Austin. Holy Names Centra High School was built on Harbord Drive and opened in 1934. In December of 1933, the first display home opened at 4339 Harbord Drive. The home had eight rooms with two baths and a 14 x 32-foot rumpus room and “pleasing features galore”. The home was priced at $6850 and was recently sold in 2016 for $1,360,000. In September of 1934, another display home was opened at 4347 Harbord Drive. The green and white wood and brick cottage and two bedrooms and a den or nursery and a large playroom. The house was priced at $6500, with just $75 down payment and $75 a month. The house recently sold for $825,000 in 2012. Their idea was to suggest that builders in the future especially in the taller buildings use white material. Oakland, as a “white city” situated before the hills in an elevated position could be remarkable sight. A great mass of white buildings, with tall spires or tower, like many of that time “give semblance of, will it is declared, Oakland truly wonderful” Oakland Tribune Sept 1914.